Hello! 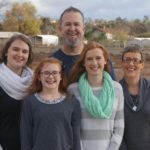 We are the Grimes family and we serve our Lord Jesus in Tirana, Albania. We have lived in Albania since 2010. We began our ministry serving alongside a national pastor at Kisha Kalvari Tirana (Calvary Church Tirana). In 2013 we began a bible study in our home that has become a fellowship – Kisha Streha (The Refuge Church). We look forward to the things the Lord has for us, our neighborhood and our fellowship as we serve Him!